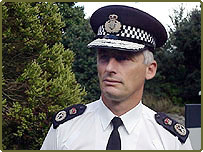 North Wales Police Chief Constable Richard Brunstrom has taken on a new role - tackling the UK's growing bat crimes. He is spearheading an initiative to protect the nocturnal mammals. Mr Brunstrom has virtually become a household name through his campaign against speeding drivers and his views on legalising drugs. Now he says he is ready to assume comic hero Batman's mantle too to save the bat. "If you can put a bit of humour into it, that's actually helpful because this is a serious issue," he said on Wednesday. "A bit of humour will help us deal with it even better". Bats are a protected species but even so their numbers are falling. 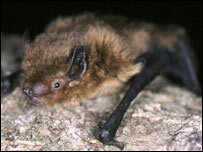 Figures from the Bat Conservation Trust show 144 bat-related offences have been committed in the UK over two years. Conservation groups now believe that that figure could be only the tip of the iceberg as the animals fall prey to building development and trees where they roost being felled. So Operation Bat, which got under way on Wednesday, is aimed at prevention and raising awareness. Mr Brunstrom, a spokesman on wildlife issues for the Association of Chief Police Officers (ACPO), has been jointly responsible for bats becoming a police priority. "The emphasis of Operation Bat is on prevention rather than enforcement," he said. "The overall aim of it is to raise awareness of the legislation that protects bats so as to provide a clear message that bat crime is police business and will not be ignored. "If you're renovating an old house or chopping trees down, we want to make sure that people get proper advice in the first place on how to keep within the law." But he admitted that patrolling bat crime was "a tiny issue in policing terms". "This is not major league police work, It's an irrelevant amount of police resources. But it is necessary that we do it right because it is in the interests of our country," he added. "The bat detectives must keep watch over these misunderstood creatures"